You can access Photoshop CC’s Layer Style Menu in two ways. In addition to the pop-up menu at the bottom of the Layers panel, you can apply layer effects through the Layer→Layer Style menu. As you can see in this figure, the Layer Style menu has a few more commands than the menu at the bottom of the Layers panel. 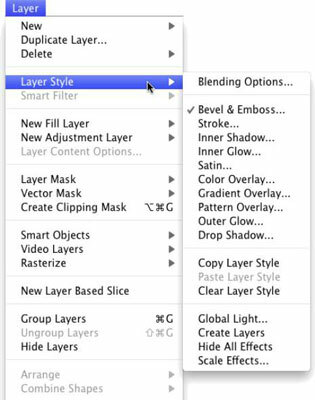 The ten items on the Layer Style menu below Blending Options are the actual layer effects. A check mark to the left of the effect indicates that it’s currently applied to the active layer. The Copy Layer Style and Paste Layer Style commands come in handy, but if you’re more mouse- or stylus-oriented than menu-oriented, you’ll find it easier to add the style to the Styles panel and click the style to apply it to other layers. You can also Option/Alt+drag a layer style from layer to layer in the Layers panel to duplicate it. Global Light: A number of layer effects are applied at an angle. Drop shadows, for example, simulate light coming from a specific angle (which, of course, determines where in your artwork that shadow falls). You use the Global Light command to set the default angle at which your effects are applied. Generally speaking, you want the angle to be consistent from effect to effect and from layer to layer in your artwork. 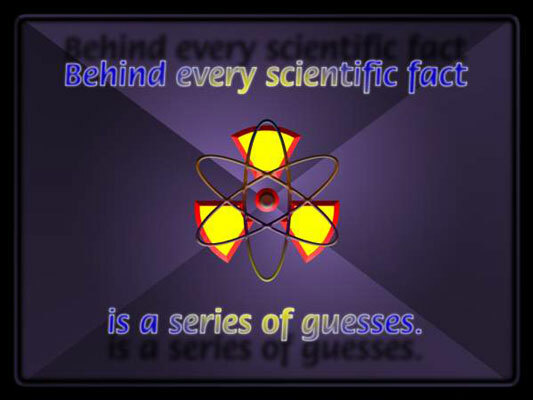 There are exceptions, however, such as the situation shown in this figure. Create Layers: Sometimes you need to edit a layer effect — say, to control where a drop shadow falls on the lower layers in the image. The Create Layers command rasterizes each layer effect (adds it to the image as a separate layer or layers containing pixels). You can then erase portions of the new layers, apply artistic filters, or otherwise customize each effect layer. Remember that after a layer style is rasterized with this command, you can no longer edit it through the Layer Style dialog box, but the original style (if you added it to the Styles panel) is still available. Hide All Effects: You can temporarily hide a layer style with the Hide All Effects command. Alternatively (and more conveniently), you can click the eyeball icon next to the layer style in the Layers panel to hide the effects. Scale Effects: Use the Scale Effects command to uniformly make the layer style larger or smaller.